Relay Output - Normally open or normally closed dry contact supervision. Algo 1202 Button, Algo 1203 Switch, EOL resistor termination. 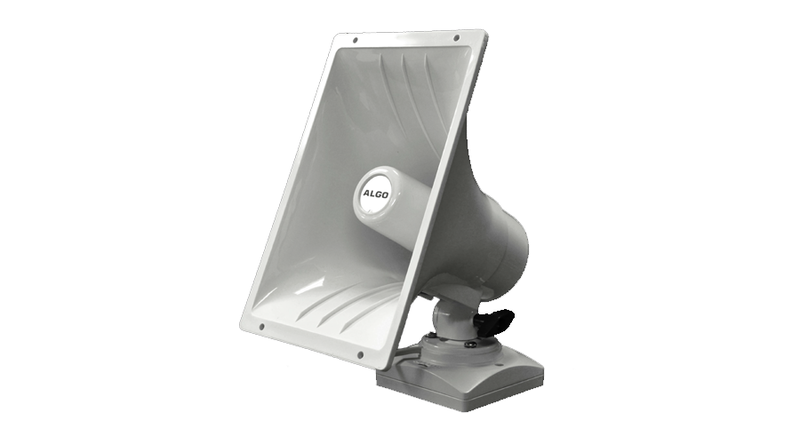 The Algo 8186 SIP Horn Speaker features wideband G.722 codec support for optimum speech clarity and intelligibility and is compatible with any premise or hosted Communication Server supporting 3rd party SIP endpoints. Polycom Group Page, OGG Vorbis (other codec support available on request). Stream, Zoned Multicast Receive, SIP Ring Alert, SIP Ring Alert & Zoned Multicast Stream. Max rating 30 V 50 mA. Normally open or normally closed dry contact supervision. Algo 1202 Button, Algo 1203 Switch, EOL resistor termination. Web interface or auto-provisioning server. Suitable for outdoor and wet environments when properly installed.